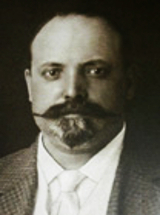 Miguel Ventura Terra was born in Seixas do Minho, Caminha, on 14 July 1865. He attended the Architecture course at the Porto Academy of Fine Arts between 1881 and 1886. In 1886, as a State bursary student in the category of Civil Architecture, he travelled to Paris. Here, he studied at the École Nationale et Speciale des Beaux-Arts, where he obtained the diploma of 1st class Architect from the French government. He also studied at the Victor Laloux (1850-1937) workshop. In 1894, he came second in the competition for the Monument to Prince Henry, in Porto. He returned to Portugal in 1896, where he became 3rd class Architect in the Directorate for Public Buildings and Lighthouses, and won the competition for the reconversion of the S. Bento Palace (former benedictine monastery between 1615 and 1833 and headquarters of the Portuguese Parliament since 1834), particularly of the Chamber of Deputies, projected by the architect Possidónio da Silva and destroyed by a fire. He designed small palaces, qualified investment property, mainly in the capital, planned eclectic, cosmopolitan and practical constructions, in addition to important urban equipment, such as the first Lisbon kindergarten (1901), the building of the Associação de Protecção à Primeira Infância (Child Protection Association), the Dr. Alfredo da Costa Maternity Hospital (1908) and the following high schools: Camões (1907), Pedro Nunes (1909) and Maria Amália Vaz de Carvalho (1913). Miguel Ventura Terra also designed the two Portuguese pavilions for the 1900 Exhibition in Paris (Pavilion of the Colonies and Pavilion of Portugal), and the pedestal for the monument to Marechal Saldanha, together with sculptor Tomás Costa (1900), the Lisbon Sinagogue (Shaaré Tikvah or Doors of Hope), inaugurated in 1904 in Alexandre Herculano Street, the building of Banco Totta & Açores, in Ouro Street (1906), Lisbon, which was the first modern intervention in the Pombalina downtown area of the capital; the Politeama Theatre (1912-1913), representative of the Iron Art, in Lisbon, and the first project for the Vidago Palace Hotel in Chaves. In the Minho region, besides projecting the Santa Luzia Church, in Viana do Castelo (1903, finished by Miguel Nogueira), he directed the renovation of the Palace and Park of Brejoeira, in Monção, after the puchase of the estate by Pedro Maria da Fonseca Araújo, in 1901. He designed the Teatro Club (1911), nowadays Municipal Museum and the Valentim Ribeiro Hospital (inaugurated in 1916), in Esposende. In Póvoa de Varzim is attributed to him the project of the Dr. David Alves Market (inaugurated in 1904). He was also the author of several summer houses in Monte Estoril, Cascais, such as the 4 twin houses in Pinheiro street - the villas Júlia, Luísa, Hermínia e Otília, nrs 4 to 8 (1900), of Henriques dos Santos; the house in Nice street, of J. M. de Abreu Valente (1908) and the house of the General Adriano Augusto de Pina Vidal, in Bicesse street and draw the project, never executed, of the Splendid Hotel, for Cascais. He received the Valmor Architecture Award for four times (1903, 1906, 1909 and 1911) and an Honourable Mention in the same competition (1913). All his works denote his love for a not so exaggerated monumentality, for asymmetrical façades and the use of innovative materials. Ventura Terra was also involved in urbanism. He designed projects for the Eduardo VII Park, in Lisbon, had plans for the waterfront area of Lisbon (1908) and an urban plan for Funchal (1915). He was part of the group responsible for creating the Society of Portuguese Architects (initiated in 1898, created in 1902 and active since 1903) of which he was its first President. He was a member of the Council for National Monuments and was a municipal councillor of the Lisbon City Hall (1908-1913). He was friends with writers and intelectuals such as Ramalho Ortigão (1836-1915) and artists such as the sculptor António Teixeira and his brother, the architect José Teixeira Lopes, and the painters Tomás da Anunciação (1818-1879) e José Maria Veloso Salgado. A Republican and Mason, he died in Lisbon on 30 April 1919.